Why are legal arguments so hard to follow? Figure 1. View full size image, or the Rationale file. Mapping these judgements is quite hard work. This is due in part to the complexity of the arguments and their often turning on subtle conceptual distinctions. However the difficulty is also largely due to the manner of expression, i.e. the way in which judges present complex legal arguments in traditional legal prose. In a number of ways, this style of writing makes it very challenging to determine what the arguments are, at least at the level of clarity and rigour required for a well-developed argument map. A brewer cannot sell beer on the condition that the buyer engage a particular transport firm for delivery. The reason is that this would amount to exclusive dealing. Here I have used the locution “The reason is” to help the reader understand that what follows is an argument for the preceding proposition. It is even more clear that there was no exclusive dealing of the kind mentioned in s.47(7). The appellant did not refuse to supply the beer to any retailer. It was already ready to supply any retailer, either by delivering it from the brewery to North Queensland, or by allowing it to be picked up from a regional depot. The phrase “it is even more clear that” does suggest that the following proposition (there was no exclusive dealing…) is a point being established or supported. The following sentences constitute (in part) the argument for that proposition. Note however that those sentences are simply stated immediately after the proposition to be established. There is no explicit verbal flag that they constitute an/the argument. You, the reader, are supposed to just “see” that. The cue is contextual (proximity) rather than verbal. Gibbs could have said something like “This is because…” – but he didn’t; he relied on non-verbal cues instead. The trouble is that non-verbal cues to logical relationships are generally quite weak and ambiguous, and impose a heavy interpretative burden – and hence cognitive load – on the reader. Even when logical language is used, there are innumerable different forms, with subtle differences in meaning. Readers would have a much easier time identifying complex arguments if there were standard, unambiguous verbal conventions for signposting logical relations. Unfortunately, there are not. Of course there are some locutions that are used more often than others and are relatively unambiguous – e.g. “It follows that”. But you also find obscure or archaic expressions like “does not gainsay”, and use of ambiguous terms like “however” and “but”. Both of these common expressions can be functioning as argument structure indicators, but might be playing quite different role. Another problem is that only some pieces of the argument are actually presented in the prose. The rest are left unstated, with the expectation that the reader will be able to fill in the gaps. Exclusive dealing of the kind mentioned in s.47(7) would require the appellant to refuse to supply beer. Gibbs is assuming that the reader will understand that some proposition of this kind is part of the argument. In this case it may seem a reasonable enough assumption. However we know in general that people find it very hard to identify these missing parts, and when they try, there is huge variation in what they come up with. In other words, it is dangerous to assume that readers will properly “read in” the missing pieces. Even if they can do it correctly, it often takes signficant mental effort (though it is worth noting that very often, in simple cases, filling in the missing pieces is seemingly effortless). There are at least two kinds of missing pieces. The first, just illustrated, is unstated co-premises; in other words, the argument is enthymematic. The other kind are intermediate steps in the argument. Here, in Rationale format, is an alternative rendering of the argument, making clear that between the general conclusion Gibbs is drawing (no exclusive dealing) and the particular fact offered by way of proof (no refusal to supply beer) there is really an intermediate level of argument. Figure 2. Click on the thumbnail to view full-size version. In other words, judges often expect readers to fill in missing pieces both alongside and between the pieces that are provided. 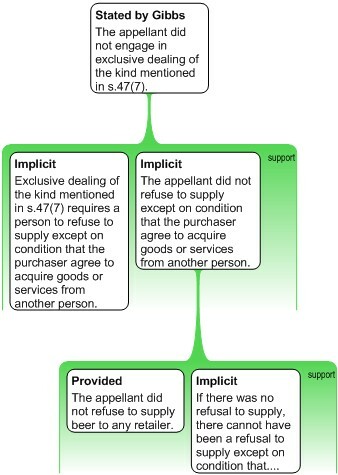 Consider an argument structure of the kind displayed in Figure 1. Suppose you had to present that argument in ordinary prose. Ordinary prose is essentially just a “linear” sequence of sentences – one sentence after another – though of course we can use some formatting to break up the monotony. An issue you would be forced to address is: in what order do you present the pieces of the argument? There is a systematic way to map a hierarchical structure into a sequence. In fact there are many such ways. However, every such way necessarily involves placing items adjacent in the sequence when they are not adjacent in the hierarchy. This is simply a topological fact, with an interesting consequence for presenting arguments in prose. It means that pieces of the argument with no direct relationship to each other must end up adjacent to each other in the text (though there may be other material, not part of the pure argument structure, separating them). In other words, the prose will “bounce around” the argument structure. When we study real examples of presentation of complex arguments in prose, such as the Gibbs judgement, and we look carefully at the order of presentation of pieces, we find that the author “bounces around” even more than is required mathematically. In other words, in terms purely of ordering, the pieces are all “jumbled up”, almost as if pieces of a jigsaw had been thrown in a bag and drawn out one by one. Of course, there will generally be some kind of logic in the madness; the author is trying to present the pieces in an order which, with the surrounding text, will help the reader understand the argument. The issue is whether the author has done as well as he could in this. Other things being equal, the more the “dis-order” or jumbling, the more trouble the reader will have in reassembling the hierarchical structure. Another problem is that a written judgement is not solely concerned with transparently presenting the argument. First, there is other material needing to be presented. For example, there are the facts of the case, including both the facts that are immediately involved in the argument as well as other information providing important context. Also there will be related issues which the judge may feel should be discussed, even though they are not part of the core arguments. The trouble is that the presentation of the argument is intermingled with all this other material. This means that the reader must pull apart what is argument, what is background, what is peripheral, etc..
On a related point, the judge has purposes in addition to transparent presentation of argument. There is a certain amount of rhetoric involved in presenting a judgement, since the goal is to persuade others such as the parties to the case, their lawyers, and other judges. Further, most judges would like to think that their written judgements are well-crafted, readable, perhaps somewhat entertaining, and possibly even literary, in a legal fashion. It turns out that these goals are somewhat in tension with the goal of presenting the argument transparently. It is certainly possible to present complex arguments in prose in such a way as a suitably trained reader can see, without inordinate effort or doubt, exactly what the argument is. The problem is that such text is not pleasant to read, and it may not be as persuasive as more mellifluous discourse. It requires a true master of argumentative writing to simultaneously reward the reader’s taste for literature or entertainment, and their desire to understand a complex argument with crystal clarity. I’ve been writing as if judges’ primary ambition, in drafting written judgements, is to transparently display a complex argument structure. But often when reading these judgements it seems that the authors are more concerned to convey the “conceptual essence” of the argument – the key insight(s) such that, if the reader get that insight, then they’ve grasped the real heart of the argument. The key that unlocks the case. How exactly that essence is embedded in a larger structure of argument may not be so important. So you find judges “talking around” that key insight or argument step, doing multiple “takes” on the presenting the point so that if the reader doesn’t quite get it one way, they’ll get it another, gaining understanding through a kind of triangulation. Clearly conveying the conceptual essence of the case is of course a very important thing to do. However it that is what the judge is primarily trying to do, then the effort devoted to this may be at the expense of, or even interfere with, transparent display of the rest of the case. Judges use written judgements to convey the complex set of arguments supporting their decision. However it is difficult to extract the arguments from those written judgements, at the level of clarity and rigour demanded by good-quality argument mapping. This difficulty is due in large part to various aspects of traditional legal prose. Judges may be more focused on conveying the conceptual essence of the argument than the full argument structure. These observations are based on a fairly small sample – a handful of judgements in the current round of tutorials, plus my occasional experience over the past few decades grappling with similar legal writings. Still, I’m confident that the factors listed would be in play in most legal argumentative writing, and indeed almost any time an author attempts to convey a complex argument in prose. Not neglecting overall argument structure while conveying the conceptual essence. Thanks for the discussion. I have found the arguments on third party access, both the initial formulation ex: the Hilmer work and then the arguments for and against access, almost impenetrable and in need of mapping. In fact I don’t think anyone really understands what the arguments are, they just want to win. The combination of commercial law, QCs, extremely big business and economists reminds me of the the “quack quack” “woof woof” cartoon. No-one cares what any of the others are saying. There is no level playing field or common ground on which the argument can play out. The general public will not be able to understand when the conclusion is presented, and I have always thought that one of the goals of legal argument should be to eventually come to a conclusion that the GP could follow. The post seems spot on. The post reminds me of the difficulties that many first year law students have with judges’ reasoning. The message typically sent by law teachers to their charges is that students have to learn to think logically. But in fact in a real sense the students have to learn to think illogically. Logically-minded students are therefore understandably perplexed. I have reflected further on your post and realised a key question that a cynic might consider. I have some observations on this. 1) If a judge clearly states a self contained component of the argument then it could be used, either in or out of context, as a quotable source in other legal disputes as a precedent. So the benefit here is that the argument component cannot be re-used or mis-used. 2) While the judge may overall have delivered a “correct” conclusion (whatever that means), if the argument is broken into components and there is a mis-statement in one of the components then overall verdict may be challengeable. So the benefit here is that nuance and ellipsis is much less open to challenge. I would suggest that the above may explain why the arguments are unclear. It is deliberate and, in a practical legal sense, understandable. There could be a lot of contributors. It may be that the lack of formal training in presenting findings and (perhaps more importantly) a lack of a designed mandatory format allow too much diversity in individual reporting style. They write it the way they learned it. Too simple and it loses some of the magic. We don’t want people thinking this is too easy. Who is the audience? It’s not written for the layman but for other lawyers and judges. How much of the authority comes from the inaccessibility? Can the judges adequately separate the intuitive element from the argumentative element in their decision making. If they’d gone through a rigourous process in making their decisions then it would be (relatively) simple to write it up that way. If they don’t it would be just too much hard work. The law doesn’t help of course. In Tim’s argument map boxes 3A-a and b there is an extra “the” which is really needed but is not in the law ( … to whom the corporation supplies THE goods …). It has been my experience as a litigator that the arguments in many legal decisions are often reflections of the arguments contained in one of the party’s legal briefs. The wording is sometimes even the same. Unfortunately, the arguments in legal briefs sometimes lack a clarity, completeness, and rigor. So these characteristics are carried forward. This is why I have found it helpful to regularly use argument maps in my briefs and as court exhibits. I find that judges appreciate the clarity. Of course, the premises in the map must depict the horizontal and vertical premises that are necessary to make each of the logical connections within the line of reasoning apparent.